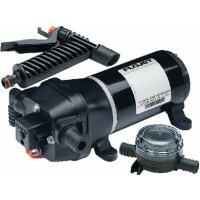 This patented, submersible pump is a great way to remove unwanted water from boats, pool covers, aqu.. Specially adapted to pump crank case oil from engines equipped with a threaded fitting on the dipsti.. These long lasting, extremely quiet pumps feature stainless steel and bronze construction, can be us..
An excellent choice for providing seawater circulation for marine air conditioning systems. The prov..
For use with a 1 to 5 gallon accumulator tank. Designed for 6 or more fixtures. Runs dry without har.. Integrated pump and accumulator tank system. Compact design may be mounted vertically or horizontall..
Makes hose removal easy and allows fast winterizing and system draining. Bag: 2Barb: 1/2" - Straight..
Makes hose removal easy and allows fast winterizing and system draining. Bag: 2Barb: ..
Makes hose removal easy and allows fast winterizing and system draining. Bag: 2Barb: 3/4" - Straight..
40 psi replacement pressure switch for Flojet pumps. 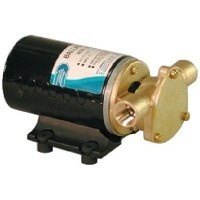 Description: Replacement Switch..
Automatic high performance diaphragm pump for deck and anchor washdown. Self-priming up to 2.4 verti.. 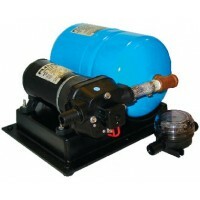 Delivers smooth steady water flow without the need for an accumulator tank. Special internal bypass ..
Centrifugal pump 12v Ports: Inlet: 3/4" NPT/Outlet: 1/2" NPTGPM: 17.. Completely assembled and water tested salt water washdown system provides pressurized water on deman..
A pneumatic pressure charge, matched to the pump cut-on pressure prevents waterlogging by separating..
Use Delrin impeller and blades not affected by diesel fuel or crankcase oil. Self-priming to 24". Mo..
High pressure wash down system. Features white powder coated, aluminum mounting plate with durable s..
High capacity marine water pump features a built in pressure switch and is both thermally and igniti.. 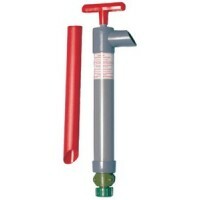 Tank is intended for installation in any pumped water system controlled by a pressure switch and can.. 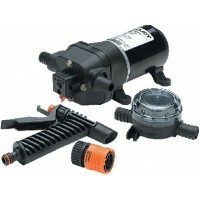 Smooth, quiet automatic water system pump serves 3 or more 1/2" outlets and is self-priming up to 10.. This large tank will smooth flow from faucets and shower, reducing pump cycling and eliminating puls..
9 GPM Ballast Puppy Pump12 volt DC operation9 gallon per minute flow rateApproximately 80 pounds of .. This electrically activated clutch pump features a bronze body with a brass insert and offers all th.. Ideal for transferring diesel fuel. 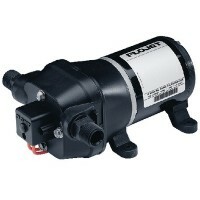 Self priming to about three feet and can pump a discharge head u..
End cover for #11810 Description: End Cover, Fits 11810 DC Pump..
End cover Ports: End CoverVolts: GPM: ..
Pump washdown hotshot5 12v Volts: 12GPM: 5.0..
See Jabsco Impeller Cross Reference and Impeller Identification Guide (previous pages) for impeller ..
Large impeller puller Size: For Impellers up to 2-1/2" to 4-1/2"..
Micro switch for #30420 Description: Micro switch for Model 44010 & 44020..
Popular, quiet, dependable belt-driven diaphragm pump serves up to 4 outlets simultaneously, runs dr.. 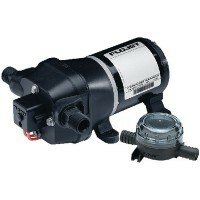 Available as automatic or manual demand pumps. 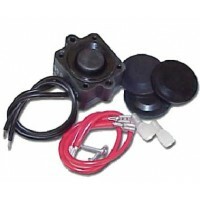 The 42630-2900 will automatically turn on when a fixt..
Molded plastic fittings. 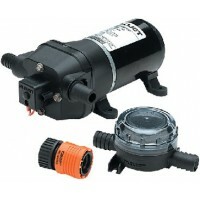 Description: Ports (Inlet & Outlet) Barb 1/2"..
Multi-outlet water pressure pump serves 2 or more 1/2" outlets at any one time. Threaded ports simpl.. Compact, efficient, corrosion resistant 3 chamber diaphragm pump can run dry without damage. Include..